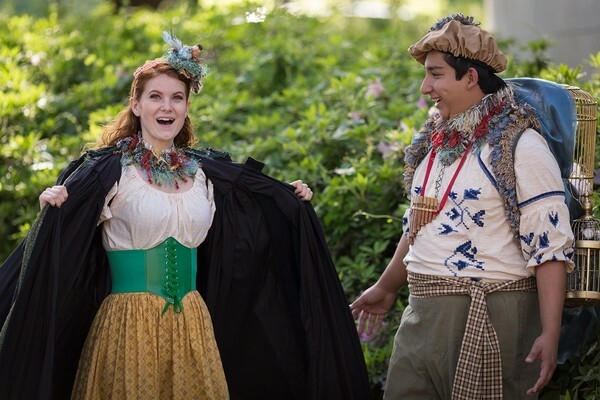 NACOGDOCHES, Texas - The voices and costumes of SFA Opera Theater's production of "The Magic Flute" are equally stunning, and audiences won't want to miss either when the schools of Music and Theatre present the classic opera at 7:30 nightly Thursday through Saturday, April 12 through 14, in W.M. Turner Auditorium on the Stephen F. Austin State University campus. Magnolia senior Brittnee Simone as Papagena reveals her true youth and beauty to San Antonio sophomore Greg Garcia as Papageno in W.A. Mozart's fairy tale for all ages. Tickets are $15 for adults, $10 for seniors and $7.50 for students and youth. For tickets or more information, visit www.finearts.sfasu.edu or call the SFA Fine Arts Box Office at (936) 468-6407.